May 2016 can be a tightly packed time of the year, but SHSU Online has development opportunities to fit any schedule! Go fully online and earn your Effective Assessment Strategies and Practices certification. 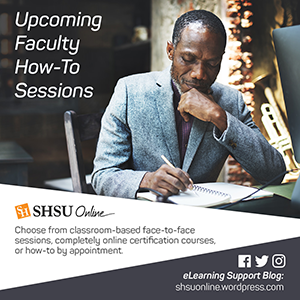 Attend one of the face-to-face how-to sessions at the MURFF or our Woodlands Campus. Effective Assessment Strategies & Practices: This three week online course takes an in-depth look at methods to increase success when it comes to evaluating students along with a look at the tools Blackboard employs to monitor, evaluate and report on student assessment. Topics covered include, but are not limited to: Hallmarks for Effective Assessment, Grade Center Basics, Best Practices for Effective Assessment, Grading Periods, Grade Columns, test Reliability and Validity and more. Effective Assessment Strategies and Practices course attendees will receive a certification upon successful completion. Learn how to show students what success looks like prior to assignment submission and provide more appropriate feedback when they do turn work in, with Blackboard Rubrics. Discover why your colleagues think that web conferencing in your Blackboard classes is a breeze with Collaborate Ultra. Find out how to quickly generate quizzes that you can import into your course with the Blackboard Quiz Generator. Remember that you can also sign up for one-on-one sessions. These sessions can be 5 minutes to an hour and can take place in your office, ours, over the phone and online. Use the same link to sign up for face-to-face or one-on-one sessions. Blackboard Collaborate – The Ultra Experience: Synchronous collaboration in Blackboard just got a whole lot easier. Introducing Blackboard Collaborate – The Ultra Experience. In real-time, share audio, video, chat, files, whiteboard and software applications on your computer with your classmates and instructor. No java plugin needed! Collaborate Ultra runs inside your Internet browser! Blackboard Learn: Rubrics – Participants will learn how to use the rubric tool that lists evaluation criteria for an assignment, and provide a means to convey expectations to students for the quality of completed assignments. This session lasts approximately 60 minutes. Blackboard Discussion Forums: This 1 hour sessions covers the ins and outs of Blackboard Discussion forums. Learn how to create, link, manage and grade discussions in Blackboard Learn. Blackboard Learn Quiz Generator: This tool was developed to help you create quizzes for Blackboard. It allows you to type up the quiz offline in a program like Word or Notepad and not have to go through the trouble of making long quizzes via the Blackboard web interface. Blackboard Learn: Blogs Wikis & Journals, Oh My! Using the latest and greatest web 2.0 collaborative tools seems like something you should do if only you knew when or how? This 90 minute session goes over each tool and demonstrates some uses cases for when they should be used.